Oil pulling, also called “Kavala” or “Gundusha,” is an age-old Ayurvedic technique that involves swishing a tablespoon of oil in your mouth on an empty stomach for around 20 minutes. This action purportedly draws out toxins in your body, primarily to improve oral health but also to improve your overall health. Unwanted organisms from the mouth, teeth, gums, and throat are also thought to be removed. Though simple, oil pulling is claimed to have extensive health benefits. 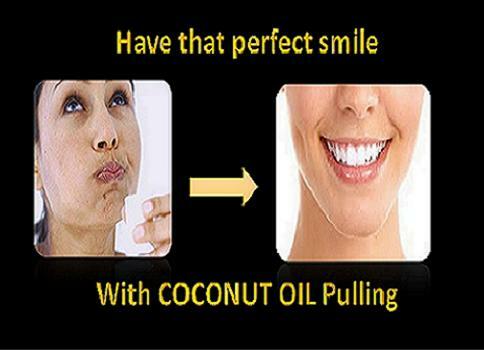 Many claims that oil pulling strengthens gums, whitens teeth and eliminates plaque. Others use it as a treatment for Temporomandibular joint (TMJ) problem, an ailment that causes pain and stiffness of the jaw. Oil pulling is also considered one of nature’s most efficient ways to detox the body. An ancient Ayurvedic ritual dating back to almost 3,000 years, oil pulling has its origins in India as part of natural healing practices, according to the National Center for Biotechnology Information (NCBI). Original practitioners of oil pulling used Sunflower and Sesame oils as a way to promote oral health and detoxification and prevent bleeding gums, decay, dryness of throat, malodor, cracked lips and for strengthening teeth, gums and the jaw. On an empty stomach, take a tablespoon of oil in your mouth and start swishing it around. First, the oil mixes with the saliva, turning it into a thin, white liquid. Lipids in the oil start pulling out toxins from the saliva. As the oil is swished around in the mouth, it continues to absorb these toxins and usually ends up turning thick, white and viscous. Once this consistency is reached, spit it out, usually after around 15 – 20 minutes. Oil pulling is highly effective at reducing tooth cavities and fighting bad breath. It reduces plaque and Gingivitis. According to some sources dental caries, or cavities, have also been shown to be reduced by half in persons who practice oil pulling particularly with Sesame oil. Just 40 days of oil pulling can result in a 20% decrease in oral bacteria. Toxins and unwanted germs in the body are much like poison causing inflammation that lead to disease and illness. The mouth is the gateway to the body for such contamination. Thus in removing the toxins at the source before they can spread, the body undergoes a complete detox. When the body is under toxic stress it results in headaches and even migraines. By eliminating some of these germs and toxins from the body, headaches can be prevented. The benefits even extend to your skin! Getting rid of toxins from the body that would otherwise end up in the bloodstream means the skin has a chance to shine. With oil pulling, rashes and skin issues reduce dramatically. Some popular oils used for oil pulling are Sunflower, Olive, Coconut, Sesame, and Palm. While Coconut is among the most popular pulling oils, it solidifies below 75 degrees Fahrenheit (23.9 Celsius) and is hard to swish around in the mouth. But when blended with Sesame or Sunflower oil the mixture will not harden and acts as a better detox. Coconut oil has Lauric acid, which is well known for its anti-microbial properties making it more effective. Other oils used for oil pulling include Olive, Sesame and Extra-virgin coconut oil, preferably organic and ideally cold pressed. They all contain essential fatty acids and antioxidants that are good for your gums and teeth. A 2009 study from the Indian Journal of Dental Research found that as against mouthwash, swishing with Sesame oil modified gingival scores, reduced plaque, and lowered microorganisms in the plaque of adolescents affected with Gingivitis. A 2014 study published in the Journal of Clinical and Diagnostic Research found that oil pulling using Sesame oil helped in reducing oral malodor and the microbes. A 2011 study from Journal of the Indian Society of Pedodontics and Preventive Dentistry found the procedure to be as effective as Chlorhexidine for the treatment of bad breath.